Hello, here's my card for the January 2012 Waltzingmouse Stamps Blog Party! This month the theme is "SWEET THINGS". Sweet things can be food items, a Valentine for your sweetheart, something you consider to be a sweet thing or however you interpret "sweet things" and as long as you use Waltzingmouse Stamps images on your creation. You can link your card or project on the Waltzingmouse Stamps Blog, check it out for full details. I mixed up a few different Waltzingmouse Stamp sets for my creation! The celtic heart is from Celtic Heritage Stamp set, the label is from Very Vintage Labels No.10, the sweet text is from Rescue Remedies (I masked the rest of the stamp) and the 'darling of my heart' text is from the Irish Blessings stamp set. The motif in pink is also from Very Vintage Labels No.10. The flowers I made, the larger one I made using the Spellbinders Rose Creations die. The other one is a Quilled Rose and I painted the tips in white. 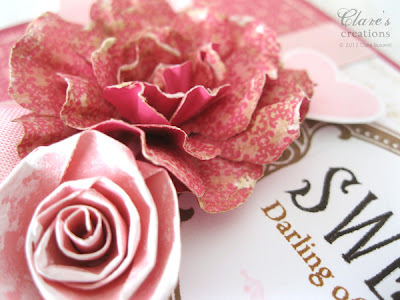 OTHER: PINK GEM, WHITE ACRYLIC PAINT, PINK PAPER, SEWING MACHINE, SPELLBINDERS LABELS 10 AND ROSE CREATIONS DIES. 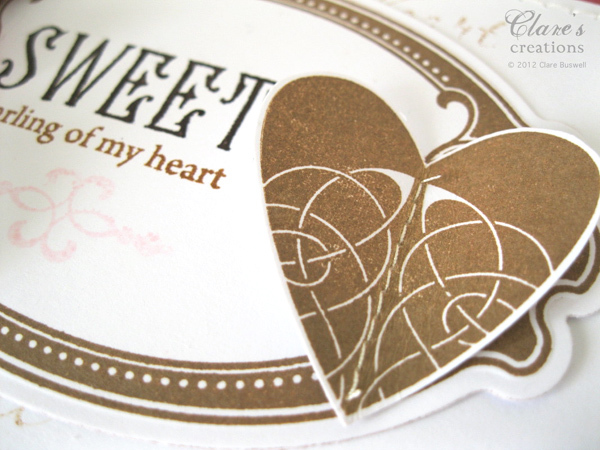 Gorgeous Clare, a wonderful mix of stamps, I love the Celtic heart, and the sentiment is beautiful! and your background is stunning! I love that Coffee ink Clare - and the wonderful mix of stamps you used on this 'oh so' pretty Valentine! Your flowers are gorgeous! Wow Clare - Gorgeous card! Your beautiful flowers steal the show! 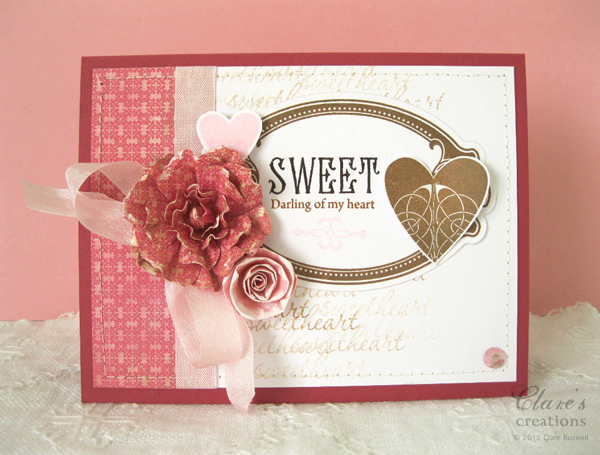 I love the clever stamped background and the way you mixed several sets to get the sentiment you wanted. The Celtic heart is so elegant with the scrolls. Beautiful, beautiful! I love the kraft color paired with the gorgeous pinks. Beautiful Valentine Clare! Love the pretty label and fabulous blossoms! Gorgeous flowers! Lovely combination of rich brown and pinks! So pretty!! The flowers look Amazing!! Simply stunning Clare - love what you created. Really beautiful card Clare! I am always so inspired when I visit... I even tried the paper ruffles the other day!! 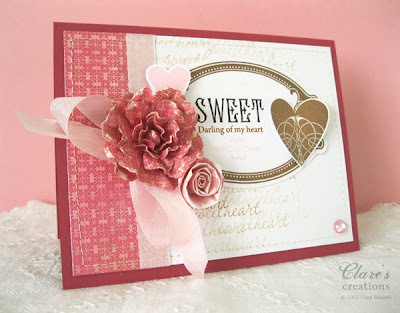 Fabulous use of sentiments on this gorgeous card! Love the colors, the beautiful flowers and the wonderful Celtic heart! This is so much you = absolutely AMAZING. I LOVE, LOVE, LOVE your card - your are so wonderful - as always ! This is GORGEOUS, the flowers look amazing!!! This is absolutely fabulous. Just perfect. I love it! Beautiful card - I love those flowers! Absolutely love the way you've made the sentiment on your card - it's super. Your cards are always an inspiration and this is no different. Love it! Your handmade sentiment is AWESOME, Clare, as are those wonderful flowers you crafted. You are tops when it comes to making lovely blooms. Such a pretty color scheme and layout, too. What a wonderful Valentine! Love the colors and the card Clare, and your flowers are awesome! Thanks so much for visiting me and for your lovely comments. Beautiful card! Love those flowers! Wow, Clare - this is an amazing color combination...I drool. Fantastic creation, especially your flower, ribbon and heart embellishments. BRILLIANT! This is so pretty and looks so...chocolately. Is that a word? Not sure, but that is what I thought of when I saw the chocolate color of the heart and frame. Super pretty and feminine. Absolutely beautiful! Such a fabulous colour combination and awesome flowers! Ooh, Clare, this is so well done! I love the way you combined so many stamps from different sets into one cohesive and beautiful card! Oh my, Clare, your card is just delightful! Love, love, love those flowers!! Just beautiful Clare--my favorite part has to be the flowers, they are so pretty! Oh, I just love everything about it!!! O my goodness Clare, this is a superb card, I love how you mixed up the sets to get your message, and the stitching on the celtic heart, whole thing is fab! Thank you so much for joining our blog party!! Love this card, thanks for the tutorial on making the rose.